As Halewood's TIC local convention gets ever closer and our circles are quietly working away on their projects, we thought it would be a great opportunity to catch up with TIC pro, Leon Bimpson, who is now in his third year of TIC. 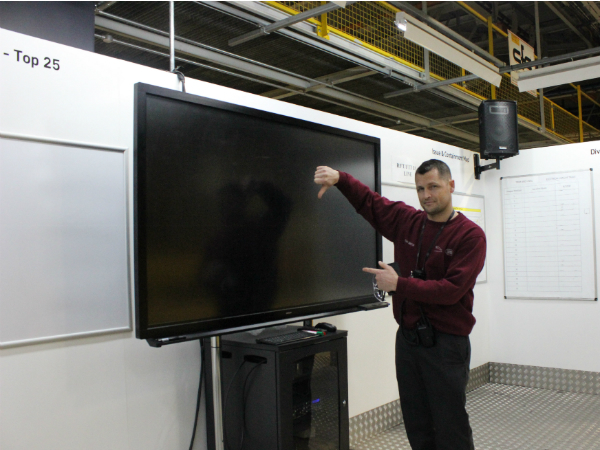 This year Leon’s team is working on a project for the digital screens around the plant that are sometimes just blank screens. The circle, known as ‘The Screensavers’, are looking to share useful information on the screens such as 5S, health and safety and important updates. The project reminded Leon of a film he watched, called, ‘They Live’, starring Rowdy Roddy Piper! Roddy plays a drifter who discovers that aliens are concealing their appearance and using the mass media to send subliminal messages. Leon’s team didn’t need to ‘phone home’ as they think our TV screens can do the same and share positive messages almost subliminally! When asked about his best experience with TIC, Leon told us about his first year of taking part in TIC, which left a lasting impression. It was during the local convention and a nervous Leon (public speaking wasn’t something he was used to!) found himself sat next to Stuart Lord, our plant director, who Leon had heard of but had never met before. They had a good chat about TIC and Leon received a text message from his daughter Macie, wishing him luck for his presentation. Leon told Stuart about the text and went on to tell him Macie, who was eight at the time, had broken her leg (the third time that year!) and was in lots of pain. Leon was really made up he had the chance to speak to Stuart but thought nothing more of it as he geared up to do his presentation. Once the day was over Leon was about to leave when he bumped into Stuart, who called him over to give him a backpack, a teddy and a little get well note for Macie. This was something that Leon has never forgotten and Macie still sleeps with the teddy now! If Leon could give one piece of advice to anyone taking part in TIC it would be, “to be confident, it’s not as daunting or as scary as it seems, just enjoy the experience”. We wish Leon and all the teams taking part in TIC this year the best of luck, we can’t wait to see all your fantastic ideas at the local convention!